We understand that your firearms licence is important. Click on a link below for information about firearms licences and how Sydney Criminal Lawyers® can assist you. Being denied a firearms licence for work or other purposes can be frustrating and time-consuming. If you’ve been unfairly refused a firearms licence for no good reason, our experienced lawyers can request an internal review of the decision by the Commissioner of Police. We will prepare all documentation and evidence to support your case and show why you require a firearms licence. Should your application be further refused, we can request an appeal by the Administrative Decisions Tribunal. What do I have to prove before I can get a firearms licence? The law imposes rigorous restrictions to ensure that only suitable persons are issued with a firearms licence. Are a fit and proper person and that you can be trusted to possess the firearm without causing danger to the public safety or peace. You have completed a firearms training and safety course. You can comply with the safety and storage requirements for the weapon or firearm. You are a resident of NSW, or you are going to become a resident of NSW in the near future. You must also prove that you have a ‘genuine reason’ for possessing or using the firearm. Your ‘way of life or domestic situation’ – for example, if you live on a farm and require the firearm to maintain livestock. Whether you have previously attempted suicide or self-harm. Your mental state and any ‘abnormal habits’. What is a ‘genuine reason’ for using or possessing a firearm? To be issued with a firearms licence, you must prove to the Commissioner of Police that you have a ‘genuine reason’ for possessing or using a firearm. A genuine reason does not include personal protection, protection of other people, or protection of property. For example, you will be denied a licence where your only reason for having a firearm is to protect against intruders or trespassers. Sport or target shooting, if you are a member of an approved shooting club. Recreational hunting or vermin control, if you are a member of an approved hunting club AND you own or reside on rural land, or the owner or occupier of rural land has given you permission to hunt or control vermin on their land. Primary production (for example, farming) where you are the owner, leaser or manager of land used for primary production, and you require the firearm solely for farming or grazing activities. Vertebrate pest control, where you are a professional contract shooter, or you are engaged by the government for animal control purposes. Business or employment – for example, where you require a firearms licence for rural purposes. Animal welfare, where you are a special constable of the RSPCA or Animal Welfare League, a vet, or someone employed by the Department of Primary Industries or the Livestock Health and Pest Authorities Division of the government, with a responsibility for animal welfare, or an owner, transporter, drover or handler of animals who might need to destroy an animal to prevent suffering. Firearms collecting, where you are a member of a collectors’ society and you have a written statement from the society confirming that your collection has a genuine commemorative, historical, thematic or financial value. Why might I be refused a firearms licence? If you are subject to a firearms prohibition order. In these situations, the Commissioner does not have to give reasons for denying you a licence. What is a prescribed offence? The law says that you may be denied a firearms licence if you’ve been convicted of a ‘prescribed offence’ in Australia in the past 10 years. An offence involving the possession or use of a firearm or weapon, such as an armed robbery. A drug offence where you received a sentence of 6 months imprisonment or more, and/or a fine of $2,200 or more. An offence involving the infliction of ‘actual bodily harm,’ or attempting, threatening or conspiring to commit actual bodily harm, where you received a sentence of 28 days imprisonment or more, and/or a fine of $200 or more. Actual bodily harm that is harm that is more than merely transient or trifling – for example, bruises or scratches, OR some form of serious psychological injury. An offence involving kidnapping or abduction, stalking or intimidation, or attempting, threatening or conspiring to commit such an offence. An offence of a sexual nature under sections 38, 61-80AA, 91C-91H and 111-113 of the Crimes Act or under s 11G of the Summary Offences Act, or an attempt or threat to commit any of these offences. An offence of fraud, dishonesty or stealing where you received a sentence of imprisonment for 3 months or more. Any offence relating to terrorism. Additionally, a firearms licence cannot be issued to any person under a good behaviour bond for any of the above offences. In some situations, the Commissioner of Police can suspend or revoke your firearms licence. Understandably, this can have a significant impact on your ability to work or engage in leisure pursuits, such as hunting or firearms collecting. However, with the right legal team on your side, you can fight to get your firearms licence back, so that you can continue working or pursuing your hobbies as you please. In what situations can my firearms licence be suspended or revoked? Under the Firearms Act, the Commissioner of Police has the power to either suspend or revoke your licence in certain situations. A suspension is a temporary cancellation of your firearms licence until a final decision has been made about whether or not you can keep the licence. If you have received a notice stating that your licence has been suspended, you will not be allowed to possess or use firearms during the specified suspension period. If you do so, you may face heavy penalties. A revocation is where a decision has been made to permanently revoke your firearms licence. You will not be able to possess or use firearms once your licence has been revoked unless you manage to have the revocation overturned. There are many circumstances which may give rise to your firearms licence being revoked or suspended. One of the most common situations is where you have been charged with a domestic violence offence, or where the Commissioner reasonably believes that you threatened or committed a domestic violence offence. Where you are no longer seen to be a ‘fit and proper person’ to hold a firearms licence – for example, where you have mental health problems or where you have threatened self-harm or suicide. If you’ve committed a ‘prescribed offence’ – see our page ‘Restrictions on issuing firearms licences’ for a full list of prescribed offences. In certain situations, if you’re subject to a good behaviour bond (including a section 10 bond (now conditional release order without conviction)). What happens if my firearms licence is suspended? Generally, before your firearms licence can be permanently revoked, it will be temporarily suspended to allow you to respond to the decision before your licence is permanently cancelled. Until a final decision has been made, you will not be allowed to possess or use firearms. If a decision has been made to suspend your firearms licence, the Commissioner of Police will issue you with a notice informing you that your licence has been suspended and providing you with the reasons why it has been suspended. You will then be given the opportunity to provide the Commissioner with a response detailing why the licence should not be revoked. In certain situations, the Commissioner of Police does not have to provide reasons for the suspension, or offer you a chance to prove why the licence should not be revoked. This generally occurs where the Police Commissioner receives information that you may be a risk to public safety, or that having a licence may pose a threat to the public interest. If your firearms licence has been suspended or revoked, the law says that you must immediately surrender your firearms licence to police, along with any firearms in your possession. Alternatively, the police can seize your firearms in cases where you do not surrender them yourself. If you fail to surrender your firearms, you could face the hefty penalty of 2 years imprisonment and/or a $5,500 fine. These penalties will not apply where your licence has expired and you have applied for a new licence. If your licence has been suspended and you wish to fight the suspension, it’s important to get an experienced lawyer on your side with a good track record of helping clients keep their firearms licence. A good lawyer can assist you in writing to the Commissioner to show why your licence should not be revoked. A compelling letter will include all evidence as to why you should keep your licence – for example, evidence to show that you need the firearm for work, or expert evidence such as psychologist’s reports to show that you are a fit and proper person. Section 25 of the Firearms Act 1996 (NSW) requires a firearms licence holder to immediately surrender their firearms and their firearms licence to police if their licence is suspended, revoked or otherwise is no longer in force. The maximum penalty for failing to do so is 2 years imprisonment and/or a $5,500 fine. The section also says that any police officer can seize any firearm from a person whose licence is suspended, revoked or no longer in force. However, the section does not apply to expired licences if the licence continues to have effect while an application for a fresh licence is being determined. If you feel that your firearms licence has been unfairly suspended or revoked, you may wish to appeal the decision of the Police Commissioner to the Administrative Decisions Tribunal. If you’ve decided to lodge an appeal against the Commissioner’s decision, it’s important that you get a good lawyer on your side with considerable experience appearing before the Administrative Decisions Tribunal. That’s where the experts at Sydney Criminal Lawyers® can help. Our experienced lawyers have appeared in countless appeals before the Administrative Decisions Tribunal in relation to firearms matters. Because our lawyers understand the need for a firearms licence in many areas of work and leisure, we fight hard in every case to ensure that our clients keep their licence. What types of decisions can be appealed? Most decisions of the Police Commissioner to refuse a firearms licence, or to suspend or revoke a firearms licence, can be appealed to the Administrative Decisions Tribunal. 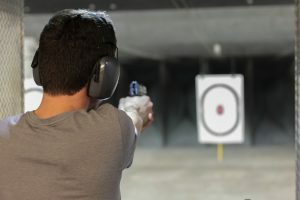 The refusal or failure of the Commissioner to issue a firearms licence or permit (other than a permit for a prohibited firearm). The revocation of a firearms licence or permit (except where the revocation is made on the basis that you are subject to a firearms prohibition order or an apprehended violence order (AVO)). The refusal or failure by the Commissioner to register a firearm. A decision under the regulations that the person belongs to a class of prescribed decisions. What types of decisions cannot be appealed? Where the Commissioner has made a decision to deny you a firearms licence on the basis of information that indicates that you could be a risk to public safety, or where issuing the licence would be contrary to the public interest. Where you are the subject of an apprehended violence order (AVO) or a firearms prohibition. Where you are under 18.